The introduction of knowledge teams, as a new form of work organisation, is one of many institutional transformations associated with the knowledge economy. The research on the effects of this new form of work organisation on the social processes by which knowledge workers exchange, create, and apply knowledge is limited. The research that does exist uses various communication theories to explain the social interactions within knowledge teams. We offer an alternative theoretical framework, based on Habermas' theory of communicative action. In this paper, we operationalise the theory using dynamic agent-based modelling to perform a series of 'virtual experiments' on the temporal dynamics of knowledge exchange within teams. The modelling results are used to critically reflect on the theory and draw conclusions regarding the lifeworld rationalisation within knowledge teams. The paper closes by specifying areas of future work and suggesting that a practical outcome of the completed research agenda will be an evaluation tool to be used by knowledge teams to assess how effective they are at communicating and producing knowledge. 1.1 The emergence of knowledge teams, as a new form of work organisation, is one of the institutional transformations associated with the growth of the knowledge economy. As knowledge has become increasingly specialised and differentiated, greater coordination of knowledge work is needed. The recent interest in knowledge management reflects the search for appropriate strategies and techniques to coordinate knowledge work (e.g. Davenport and Prusak, 1998; Nonaka, 2005). Drawing on cognitive psychology, organisational theory, change management, and other disciplinary perspectives, the knowledge management literature applies an instrumental rationality to the implementation of new procedures and protocols to overcome the 'stickiness' of knowledge for the purpose of furthering organisational goals (Szulanski, 2003). 1.2 Composed of specialists who direct and discipline their own performance through organised feedback from colleagues, clients, and the public (Drucker, 1998), knowledge teams have emerged in a variety of domains such as research (e.g. university and industry teams), practice (e.g. health care) and policy (e.g. school and health boards). 1.3 Much of the theoretical work on knowledge teams conceptualises knowledge as a collective, not a private good, that is developed and shared within groups that are self-organising (Knorr-Cetina, 1999; Wenger, E. 2000; Wenger, E. et al. 2002). Members of knowledge teams are brought together by a common purpose, a sense of identity, and a repertoire, in the form of stories, jargon, and theories, for establishing shared meanings. While we share this view of knowledge teams as being self-organising systems and knowledge as being socially constructed and embedded in a set of social relationships, we are turning to Habermasian theory for a more comprehensive theory of social coordination and one that makes explicit the normative aspects of communicative processes. Recent methodological advances support this conceptualisation of knowledge teams as self-organising systems. Dynamic agent-based modelling has been used to model knowledge teams by specifying the social rules governing the interaction between team members and their consequences, using mathematical concepts and expressions to operationalise these rules of interactions (e.g. Contractor and Monge, 2002; Palazzolo et al., 2006). With few exceptions, however, the current efforts to model the dynamics of knowledge teams use communication theory to guide the operationalisation of the rules of interactions. While we build on the methodological advances brought about with dynamic agent-based modelling, we offer an alternative theoretical framework, arguably one of the most important sociological theories of communication understood in social, evolutionary terms, that is, Habermas's theory of social transformation. In particular, the starting point is Habermas's analysis of the distortion of the modernity project as a result of the rationalisation process in the system being given importance at the expense of the rationalisation of lifeworld. We focus on the ideal outcome of social learning, that is non-pathological, progressive social evolution. Working at the level of meta social theory, Habermas takes on the analytic project of elaborating elemental concepts such as "lifeworld", making it possible for them to be profitably employed by meso- and micro-level theorists. In doing so, Habermas provides the necessary level of detailed description of elemental concepts for the modelling enterprise. 1.4 Despite the vast literature associated with Habermas's theory of social transformation, it has not yet been operationalised to any extent (see Fishkin and Van den Daele, as cited in Habermas, 2006, and Jacobson, 2004 as exceptions). This paper is one of the few attempts to operationalise Habermas's theory by using dynamic agent-based (DAB) modelling. 1.5 The work is part of a broader mixed methods research program investigating the institutional arrangements associated with the coordination of knowledge processes. This paper contributes to the broader project by exploring the way knowledge is produced in the context of transfer and application within a particular institutional order, that of multi-disciplinary knowledge teams. The modelling of knowledge teams, undertaken in this paper, is accomplished by engaging in a critical reflection with Habermasian theory. While we have chosen to use Habermasian theory for the project of modelling knowledge exchange, other social theory might well be enlisted for the enterprise. For example, the use of Elias's (1994) theory, with the required operationalisation of his concept of shame and repugnance thresholds, might prove fruitful. 1.6 Social scientists tend to be skeptical about the validity of any computer-aided modelling, particularly when it is used for theory building rather than theory testing. We are unapologetic about our use of the exploratory modelling for the purpose of theory development. By way of a demonstration of the pragmatic paradigm to mixed methods research (Morgan, 2007), the paper argues that important theoretical gains can be made in the course of constructing and evaluating a series of virtual experiments involving simulations of DAB models. Meaning and significance of the theory emerge in the process of defining the generative mechanisms of the model; further meaning and significance is derived from reflecting on the results of the model simulations. The insights that emerge from our exploratory modelling are tentative; they are concretised by testing and validating the models against empirical data, accomplished in subsequent papers. 1.7 The paper opens with an argument for extending the conceptualisation of knowledge teams as both self-organising systems and socially coordinated forms of work organisation. The models that correspond to this conceptualisation are then described and analysed. Finally, connections are made to the future initiatives of the research program in the conclusion. 2.1 A defining feature of post-industrial society is the emergence of a 'knowledge system' as a set of differentiated roles and institutions associated with the knowledge processes: production, transfer, and application. The processes are increasingly routinised and formalised through a complex, negotiated set of social relations (Holzner, 1983; Holzner & Marx, 1979). One set of social relations is the knowledge team. 2.2 Historically, the knowledge processes, in the context of the production, have operated at least as far back as the craft guilds in the 12th and 13th C. In post-industrial society theoretical knowledge is also created, translated, and applied for the purposes of innovation in the production processes. However, the particular way in which the knowledge processes are currently coordinated is associated with the other technological, economic, and social transformations of the last third of the twentieth century. In the research context, the formation of knowledge teams is associated with the inclination of the historically-specified boundaries of the disciplines to become increasingly elastic and the categories of 'pure' and 'applied' knowledge to all but collapse. In the health context, knowledge work has traditionally been organised on the solo actor model in which well-defined professional and disciplinary jurisdictions prevail. Each discipline or profession is associated with a discrete body of esoteric knowledge, a particular social status, and a market share.Clinical decision-making is seldom subject to peer review: expert advice is delivered by individual professionals in the privacy of the consulting room. In the solo practice model, the application of professional knowledge is individualised and impenetrable to the scrutiny of peers or the public. Although knowledge teams are a new form of work organisation, in which decision-making is communicatively coordinated, they do exhibit some features of previously identified, well-theorised types of work such as professional and industrial work. Team members acquire a particular body of esoteric knowledge through protracted training programs. The work itself is self-transforming, self-defining and execution is not readily separable from conception. Yet, similar to industrial workers, the discretion and autonomy of team members is often constrained by system-level administrative imperatives. Thus, knowledge teams are both and yet neither of the already understood forms of work. Further, unique to teams, is a mode of surveillance of work processes that is not characteristic of either professional or industrial work. 2.3 Knowledge teams are comprised of the team members, or social actors, and their interactions that are governed by particular procedures. Through their communicative accomplishments, knowledge teams (re)produce and transform the norms that govern their subsequent interactions. Over their evolution, teams develop their own procedures to manage the exchange and synthesis of knowledge in a collective discursive space. That is, knowledge teams exhibit the fundamental characteristics of a 'self-organising' system. 2.4 This notion of self-organisation is a central focus of complexity theory (Byrne, 1998; Cilliers, 1998; Eve, Horsfall, and Lee, 1997; Holland, 1995; Luhmann, 1990; Mingers, 2004; Prigogine, 1997; Urry, 2005). It corresponds with the ideas of leading sociologists such as Giddens (1984) who emphasised the way social structures are continually (re)produced and transformed through the very social activities that they govern with observable regularity. 2.5 In contrast to traditional systems theory, which conceptualises a system as maintaining stability by using 'inputs' from the environment and turning them into 'outputs', in self-organising systems the components are both the inputs and outputs (Mingers, 2002). In self-organising systems, it is the structures (norms, positions, practices) themselves that are being (re)produced and transformed over the time. 2.6 Social activities in self-organising systems are akin to walking through a maze whose walls rearrange themselves with each footstep taken. The order that emerges in self-organising systems is a bounded set of outcomes of the system ('strange attractors') that become visible only over time, yet each particular outcome is not predictable from the initial conditions. 2.7 There are many studies that use the concepts of complexity theory to analyse social phenomena, from voting or purchasing behaviours, arms races, and children's friendships (Stewart, 2001) Indeed, society need not be considered as an overall, coherent social system, as Parsons did, in order to still consider it valid to investigate particular aspects of society that are genuinely self-organising. However, as Stewart (2001) argues, most of the existing studies that examine social phenomena using the concepts of complexity theory are reductionist, not because they rely on mathematical models, but because they do not sufficiently engage with the relevant social theory. In contrast, our understanding of knowledge teams as self-organising systems is set within the larger context of Habermas's theory of social transformation. The subsequent section takes up this conceptual enterprise. 2.8 Habermas is one of the leading critical sociologists to have taken up the project of describing and explaining social transformation, which avoids the tendency of individual reductionism or structural determinism (Habermas, 1984; 1996). He theorises social transformation as the outcome of the dual rationalisation of systems and lifeworlds. Systems are embedded in pre-existing and co-evolving lifeworlds. Communicative power is the medium of transforming lifeworlds, whereas economic and administrative power is the medium for transforming systems. These forms of power, which circulate in and between both systems (economic and administrative) and lifeworlds (communicative), may be enabling or inhibiting, depending on the particular context and the substantive issues that are confronting the members of the knowledge teams. 2.9 Habermas's theory suggests that linguistic expressions are necessary, but not sufficient, elements to be considered when studying communication. In his conceptual framework, communication is more than linguistic expression and can not be reduced to simply the media for exchange of information. Each linguistic expression advances simultaneously three different types of validity claims: factual, normative, and authenticity claims, one of which is explicit and the other two are implicit. 2.10 Validity claims, embedded in each linguistic expression, are constitutive of the three action dimensions of the lifeworld: it is actors that assert, evaluate, and challenge the three types of validity claims. There is a one-to-one correspondence between the action and the three structural dimensions: factual claims correspond to the cultural dimension of the structure of the lifeworld, normative claims pertain to the social dimension, and claims of authenticity are associated with the identity dimension of the structure of the lifeworld (see Figure 1). 2.11 Using this Habermasian frame, we consider knowledge teams to be both self-organising systems and socially coordinated forms of work organisation. The process of acquiring knowledge is social: it is learned through participation within the group and through the adoption of shared practices. As a social process, knowledge exchange has a normative aspect. When the social coordination of a knowledge team is oriented by a practice of a discourse ethic, 1) the team members with competence to speak and act are allowed to take part in the exchange, 2) everyone is allowed to question, introduce any assertion, and express his/her attitudes, desires and needs, and 3) no speaker can be coerced to relinquish his/her rights as a participant in the exchange (Habermas, 1996). A discourse ethic is the moral foundation (i.e., norms) of communicative action. The norms are presupposed by participants in argumentation, but the validity of the norms of the discourse ethic must be established inter-subjectively (i.e., practiced in social action) and cannot be understood or assumed apart from the communicative action that they ground. The mere fact that there is freedom to contribute to a discussion signifies that a discourse ethic is operating regardless of whether contributions are actually made. Sources of changes in discourse ethic can be outside the team: team members can learn something about their fellow team members and/or the institutional context that makes them more inclined or less inclined to practice the discourse ethic at particular points in time. 2.12 The goal of communication oriented by a discourse ethic is to achieve mutual understanding on contested validity claims. There is a joint commitment to reaching mutual understanding through the collective re-consideration of individually held assumptions. Individuals are not granted the differential ability to silence counter validity claims on the basis of their professional status or any other attribute, and alternative interpretations proposed by other members. Claims based on factual knowledge, normative understandings, and members' authenticity are all open for challenge. Communication, therefore, involves more than the exchange of information. 2.13 Even when mutual understanding is not reached in the process of interrogating normative assumptions, knowledge is gained and the traditional disciplinary knowledge boundaries are perforated. Conclusions drawn by the team are temporary in the sense that they can be revisited whenever participants wish to re-evaluate their validity and acceptability. Claims are continuously exchanged, challenged, and elaborated. Members' ability to make reasoned arguments concerning the local decision context is evaluated in 'real time' by their fellow team members during the intra-team deliberations. In the deliberative process, assumptions are articulated and re-evaluated. Dialogue, particularly that which involves disagreement, challenges existing premises and requires team members to make sense of their experiences and extend their knowledge base in new, often unexpected ways. Thus, the knowledge team is the site for the production of new levels of mutual understanding relative to factual (i.e. physical and social) knowledge, normative practice, and individual and collective identity. 2.14 In our models, we assume that communicative power is a medium of social coordination that is multi-dimensional and circulates among the three structural dimensions of the lifeworld. We have designed the generative mechanisms for our dynamic agent based modelling to correspond to the three dimensions of the lifeworld (see Figure 1, above). The generative mechanisms are detailed below following a discussion of the methodology, assumptions, and hypotheses of the models. 3.1 Dynamic Agent Based (DAB) modelling analyses the dynamic behaviour of a system and the 'emergent' properties that results from the local interactions. DAB models differ from previous mechanistic attempts to describe change in systems by describing the change over time in components and their relationships in terms of each other. Whereas the classical, deterministic approach to modelling systems dynamics uses differential equations to explore a system's behavior on a global or macro level, DAB modelling analyses a system by looking for local interactions and their specific rules. DAB models capture the global properties that are not reducible to the sum of local properties. Although not predictable, future states of the systems are not random or chaotic. Patterns emerge in the successive iterations of system states. 3.2 As a result of the methodological developments brought about by DAB modelling, it is now possible to simulate the evolution and dynamics of knowledge teams. Blanche, one of several DAB modelling software packages, is used in the paper. In the context of the models, knowledge teams are understood as a set of social actors and the social rules which govern the relations between them. Mathematical equations are used to specify those rules and their consequences, i.e., the dynamics the rules generate. These equations are non-linear: that is, interaction effects are taken for granted so that the combined effect of two influences are not simply the sum of the separate effects. The equations are, however, solvable, that is, with values at a given point in time, we can calculate values at the subsequent point in time. 3.3 We use a meta-theoretical approach to guide the development of the generative mechanisms of the models: these mechanisms specify how each team members' attributes and the relations between team members change over time. As stated above, the generative mechanisms are derived from Habermas's theory of social transformation in the context of our mixed methods research program. 3.4 The process of creating the generative mechanisms involved 'backstage interpretive work'. As two sociologists, who share substantive research interests, but have different training and orientations (one a qualitative, the other a quantitative researcher), the work required many long discussions during which we sought points of overlap and connection to see how our different forms of knowledge could be combined and integrated in order to represent the fundamental concepts of Habermas's theory in the mathematical form of the generative mechanisms. In keeping with the pluralism which is fundamental to the pragmatist tradition of mixed methods research (Morgan, 2007), we brought to bear our different ways of knowing to the dialogical enterprise of essentialising the structure and function of the theoretical concepts. The result of this backstage interpretative work is the conceptual model (Figure 2, below), which is used to underpin the model specification by indicating the relationships between the generative mechanisms. The conceptual model captures the notion that mutual understanding emerges from interactions between team members and both constrain and enable subsequent interactions. The mutual understanding obtained through one interaction results from, but then contributes to the changes in, individual member's discourse ethic, their knowledge, and the occupational distance between them and other members. 4.1 Knowledge teams are complex, self-organising systems and socially coordinated lifeworlds. That is, the communicative mechanisms by which knowledge teams over the long term are created, maintained, dissolved, and reconstituted are iteratively determined by both exogenous and endogenous factors. The endogenous factors affecting the teams' dynamics are the social characteristics of the team. Specifically, they are: 1) the occupational distance between team members, 2) the context-independent knowledge, 3) the discourse ethic held by each member, and 4) the mutual understanding between individual team members that has been acquired with the team-based social interactions. The exogenous factor of the mutual understanding between individual team members acquired in social interactions that are outside the team, is implicitly incorporated into the model by the addition of a random component in the generative mechanisms (described below). By including the occupational distance and the discourse ethic generative mechanisms, the models differentiate between normative and structural dimensions of teams and thus capture the possibility of teams in which the members are not courteous to each other yet are egalitarian. 4.2 Mutual understandings emerge from team-based interactions. That is, meaning is created in the context of pair-wise interaction between team members. Further, mutual understandings both constrain and enable subsequent interactions. The means of achieving mutual understanding is communicative action. Communicatively achieved mutual understanding establishes the basis for coordination of the teams' decision-making. As a social process, the achievement of mutual understanding is subject to distortion by repressive forms of power. For example, in the deliberative process, repressive power can manifest as the differential ability of one to silence alternative interpretations presented by another. Repressive power in the model is reflected by the presence of a relational variable, occupational distance. In contrast to repressive power, communicative power, held by the group, is the capacity to facilitate mutual understanding between members coming from other member's contribution to the collective enterprise of bridging different frames of knowledge: the assumptions, categories, methods, truth tests, and associated cultural norms and ideologies held by others. the greater the occupational distance between team members at its inception, the less mutual understanding will be achieved by the team. Over time as mutual understanding increases, the members' knowledge and discourse ethic will increase and the occupational distance between members will decrease. 4.3 The above hypotheses are captured in four generative mechanisms. The first three correspond exactly to the dimensions of the lifeworld (see Figure 1, above). The fourth generative mechanism, mutual understanding, is both a consequence of, and an input to the first three mechanisms. The relationships between the generative mechanisms are visually represented in the conceptual model (see Figure 2, above). Discourse ethic is an attribute of each team member, which increases and decreases with the gain and loss of mutual understanding, respectively. In addition to being an individual attribute, discourse ethic is an element of the societal dimension of the structure of the team's lifeworld and simultaneously, discourse ethic enters the social coordination of the knowledge team as a normative validity claim. Therefore, discourse ethic is both a structural and action dimension of the team's lifeworld embodied by members of the team. Fluctuations in team members' discourse ethic arise from both exogenous and endogenous sources. For example, overhearing gossip about another member's lack of commitment to the team can have repercussions on a member's discourse ethic by the introduction of suspicion, loss of trust, and a questioning of others' sincerity. Alternatively, if a member acquires some damaging information concerning the broader institutional conditions governing the team's work, they might feel alienated, cynical, and less motivated to practice a discourse ethic. In the model simulations, values for the discourse ethic are allowed to fluctuate between 1 and -1, with negative values indicating team member's attempts to sabotage the deliberative process. Knowledge is an attribute of each team member, which increases with both the gain and loss of mutual understanding relative to factual (i.e. physical and social) knowledge. That is, each individual acquires new generalisable knowledge as a result of the interaction even when no mutual understanding between members has been secured. Knowledge is an element of the cultural dimension of the structure of the lifeworld and enters the social coordination of the knowledge team as a factual validity claim. So, knowledge is both a structural and action dimension of the team's lifeworld embodied by the team members. Exogenous sources of knowledge include team members attending conferences, reading professional journals, and conforming to professional codes of ethics and legislative requirements. In the model simulations, values for this variable range between 0, which represents narrow, context-specific knowledge, and 1, which represents the most generalisable knowledge. Occupational distance is a relation between team members. It is initially defined on the basis of a team members' occupational status and then changes in relation to how the team member performs their occupational role within the team. Over time occupational distance decreases and increases with the gain and loss of mutual understanding, respectively. On the one hand, occupational distance, as a status, is an element of the identity dimension of the structural dimension of the team's lifeworld (see Figure 1). On the other hand, and simultaneously, occupational distance, as a role, enters the social coordination of the knowledge team as an authenticity validity claim, which can only be demonstrated, not tested in the way that factual and normative claims can be. Each actor's authenticity is assessed by the perceived fit between their role-based actions and their expressed claims. So, occupational distance reflects both the structural and action dimensions of the life-world. In the model simulations, values for occupational distance reflect the distance between members based on their respective roles in the team. The value 0 indicates the complete absence of perceived distance, 1 represents a perceived maximum distance between two members. Mutual understanding is a relation between team members, which increases and decreases according to levels of discourse ethic, knowledge, and occupational distance. The impact of these three dimensions of the lifeworld on mutual understanding is specified in the model to diminish with time to reflect the assumption that team-based procedures governing the deliberative process have a tendency to become routinised over time. Mutual understanding is summed over the network in order to capture the formal as well as the informal interactions between team members. Decreases in mutual understanding can occur with either regressive or progressive outcomes. In the regressive case, mutual understanding is lost because of external forces, such as the fulfillment of externally imposed requirements on the team, and consequently members become less cooperative. In the progressive case, mutual understanding is lost because the individuals recognise that they are speaking about different things. By recognising that they have different interpretations of the same series of events or different normative assumptions, individuals develop further understanding. In the model simulations, values for this variable range from 0 to infinity. 5.1 The series of computationally created teams are based on the five hypotheses and involve three variables that determine mutual understanding: discourse ethic, knowledge, and occupational distance. Each of these is assigned starting values for the modelling process. 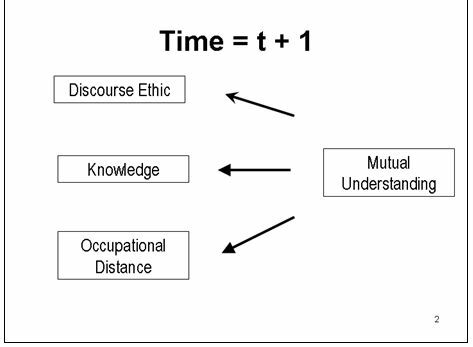 Discourse ethic is assigned four possible starting values, two positive and two negative; the knowledge and occupational distance variables are each assigned two possible starting values, high and low. The result is a 4 x 2 x 2 complete factorial experimental design (see Table 1). Each of the 16 models were run 50 times based on stochastically generated distributions of the starting values using Blanche's facility to produce normal distributions based on the following specified means and standard deviations: +/- high is prescribed by a mean = +/- 0.7 and a standard variation = 0.05; +/- low is prescribed by a mean +/- 0.2 and a standard variation of 0.05. Each of the 16 models was run 50 times, each with different starting values, to simulate lifeworld rationalisation. The simulation was carried out for 99 iterations for each model and the average values from the multiple runs were used to generate the graphical output analysed in the next section. Team structure is kept simple by limiting the teams to three members . 6.1 The four hypotheses, outlined above, are confirmed from the graphical output of the models. Hypothesis 1. In all the models that were run with starting values of the discourse ethic of all team members that were negative, the resulting mutual understanding was never able to progress beyond zero. Hypothesis 2. When the models are compared pair-wise, that is, models that are in every way similar except for the starting values of team members' knowledge, we find that without exception, those with high starting values have higher absolute levels of mutual understanding achieved over time. Hypothesis 3. A pair-wise comparison of the models with low starting values of occupational distance against those with high starting values reveals that uniformly higher absolute levels of mutual understanding are achieved in teams with less occupational distance between their members. Hypothesis 4. An inspection of the graphs of the models indicates that only knowledge has a monotonic trajectory. Graphs of discourse ethic and occupational distance mirror the oscillating pattern of mutual understanding. Given that the generative mechanism for the knowledge attribute specifies that increases in knowledge result from both gains and losses in mutual understanding, a monotonically increasing graph for knowledge is an expected outcome. Over time, we expected that mutual understanding would increase, although not monotonically, and accompanying the incremental increases of mutual understanding, knowledge and discourse ethic would both increase and occupational distance decreases. Such global patterns most closely accord to the model that represents a hierarchical team with the low values for the starting knowledge and discourse ethic of its members (for the sake of brevity, we refer to this model as the HYP model � see Appendix A). The modelling also produced unexpected results in the form of models in which there are wild fluctuations in mutual understanding. In contrast to the HYP model, these models reflect non-hierarchical teams (low starting values for occupational distance). Of these, we choose the model that displays most radical departure from the hypotheses (we refer to this model as the NON_HYP model � see Appendix B) and dedicate the next few paragraphs to an analysis of this model. 7.1 The NON-HYP team achieves the highest absolute level of mutual understanding, but with the greatest fluctuation. The NON-HYP team is constantly creating, dissolving, and re-creating their mutual understandings. Levels of mutual understanding are dynamic and fluid. The development of mutual understanding in this team is not uniformly progressive, although there is regularity, an ordering, a patterned messiness. The comparison between these two proto-type models accords with recent findings from other studies of social evolution (e.g. Kluver 2002; Kluver and Schmidt, 1999). These studies demonstrate that structural hierarchy within a social system yields simple dynamics whereas social equality gives rise to complex dynamics. Kluver and Schmidt's results accord with Habermas's theory of social transformation, which proposes that the dynamical complexity of modern democratic societies is, at least in part, due to their democratic structures. 7.2 The oscillation in mutual understanding within the NON-HYP team suggests that no one dominant position on all matters comes to the team's attention; to use an adage, there is no 'group think'. Discussion within the team twists and turns as the members critically reflect on their circumstances and the particular characteristics and requirements of each decision as they are made. In the process of their critical reflection, the team members continually reaffirm their understanding of their conditions. Individually held assumptions are constantly being articulated, challenged, and re-considered. Through their dialogical exchange, the members collectively arrive at answers to the questions they pose to each other. Within the team there is maximum flexibility to be collective, in that the team acquires shared understanding, and at the same time is individualistic in that each member is free to vary in their dedication to the process of regenerating the team's communicative infrastructure. There are moments when members can and do put their own self-interest ahead of the interests of the collective. These findings directly support Bryan Turner's (2006) critical recognition theory, in which he proposes that reconciliation is not an inevitable, or even the most desirable outcome of mutual recognition. 7.3 Within the NON-HYP team, communicatively achieved understandings between team members have both progressive and regressive influences and effects. Losses in mutual understanding are the frontiers for subsequent gains and vice versa, gains are the doorways to future losses in understandings. Each interaction contributes to a global order, but the order exists in the backwards and forwards flows of the deliberative process. A heightened discourse ethic leads to more vigorous questioning and debating of assumptions that have been secured on the basis of tradition, past practices, and institutionalised social and cultural norms. 7.4 The NON-HYP model demonstrates that there is continual slippage from the structural and action dimensions of the lifeworld. The relations of the team coordinate changes in the individual members' commitment to the discursivity of those relations. The relations also influence changes in the level of individually accrued knowledge that transcends the local context of those relations. The dimensions of the lifeworld develop in a symbiotic set of relationships within which each actor is transformed as a result of the many interactions. Thus, social interaction can not be abstracted from the attributes of the humans engaged in it. Each member exists as part of the fabric of mobile, inter-dependent relations. In coordinating the teams' interactions, the rules of interaction also regulate the accumulation of each individual members' knowledge and discourse ethic. In turn, these individuals' attributes contributes to the group-level understandings and relations of power. 7.5 Characterising the rationalisation of the lifeworld as operating according to a network logic brings to light the complicated, yet enduring connections between processes and structures of the lifeworld across space and through time. We can understand the lifeworld as a mobile in which small perturbations in one dimension instantaneously translate to other dimensions. Rationalisation produces reverberations: shock waves spilling over from one part of the team to the others. Through a series of negative and positive feedback loops, as seen in the models, the rationalisation of the lifeworld has unintended, non-linear consequences. The very process of achieving mutual understanding paradoxically results in losses of conceptual ground, retraction of previously held assumptions, and further questioning. Yet, out of the creative, discursive interrogation of facts, norms, and claims of authenticity, new knowledge is produced. New understandings help to constitute new bases for questions and challenges, and so on. Under these circumstances, system power never gets a chance to usurp the team's communicative power. Hierarchies are built only to be subsequently dismantled. While lifeworld participants are not seeking greater hierarchy as they engage in collective deliberation, as discursive agents, they open the floor for hierarchies to emerge, only then to dissolve and re-emerge. The findings suggest that the rationalisation of the lifeworld must involve more than achieving some critical threshold of mutual understanding beyond which further understanding might be guaranteed. Achieving any level of mutual understanding does not guarantee future lifeworld rationalisation. 7.6 The findings also suggest that the NON-HYP team has the characteristics of being unsustainable. The team members must donate enormous time and energy to develop action decisions. The process of continuous re-generation of norms, roles and solidarities impose extensive time and energy requirements and overburdens the communicative infrastructure. We might ask, where does this dynamic evolution eventually lead? 7.7 The emergent order of the team's lifeworld is one of constant disequilibrium, which threatens the very existence of the team. In the long term, over extended periods of time, the disequilibrium of lifeworld exacts a tremendous toll on the individuals. At some point, the team members must 'burn out'. If they are not allowed to leave the team at this point (and our models did not incorporate turnover of members), the team itself burns out. Alternatively, it gets checked by some external force, that is, some form of system-level governance would dampen the wild fluctuations in the deliberative processes. The introduction of administrative and economic functions of the system would prevent the over-burdening of the team's lifeworld. Thus, the system is needed to contain the extreme oscillations and produce converging trajectories of lifeworld rationalisation. In the language of complexity theory, system rationalisation on the lifeworld acts as a 'strange attractor'. 7.8 The introduction of system logic will carry both damaging and emancipatory potentials. On the one hand, infusing system resources will increase the teams' capacity to operate as knowledge workers and might even offer them entry points to penetrate and influence other elements of the knowledge system beyond the team. On the other hand, the newly formed relationships, legitimated through instrumental and strategic action, can distort the teams' normatively based and communicatively secured solidarities. An empirical question that follows from this is what is the optimum amount of system intervention? Our models indicate that the advance and retreat of lifeworld rationalisation needs to be modulated by system world functions. Theoretical work within a Habermasian frame needs to be done to elaborate the specific mechanisms and outcomes of such lifeworld and system intergration. Further modelling could complement and contribute to this theoretical project by refining the models developed thus far to incorporate system-level interventions � economic administrative subsystems. A series of virtual experiments would then be undertaken to identify the nature and extent of system rationalisation that is optimum for maintaining system and lifeworld balance. 8.1 There has been significant theoretical ground gained in the general study of knowledge teams by conceptualising them as self-organising systems. However, in most of the existing literature on knowledge teams, communication as a means of social coordination is left un-theorised and there is little discussion that takes into account the dimensions of the lifeworld. In this paper, we address this deficiency by starting with a Habermasian theory of social evolution in order to understand knowledge teams as both self-organising systems and socially coordinated forms of work organisation. 8.2 Capitalising on recent methodological developments in social network analysis, which allows us to consider the temporal dynamics of the teams, we have developed a set of virtual experiments conducted for this paper to model the social typology of the lifeworld as it evolves iteratively over time. We have designed the generative mechanisms for our dynamic agent based models to correspond to Habermas's three structural dimensions of the lifeworld. The resulting models constitute an effort to operationalise Habermas's theory of communicative action. 8.3 The modelling results demonstrate that the consequences of lifeworld rationalisation are ordered, with mutually reinforcing, intertwining influences to create a 'patterned messiness'. In our discussion of the findings, we focus on the model that reflects the non-hypothesised team and in doing so we see social evolution that is progressive and non-pathological. It is the model of social evolution, which Habermas proposes that we need to work towards. We contribute to such a project by identifying some of the characteristics of the model that portrays the progressive social evolution. 8.4 In keeping with Habermas's analysis of the distortion of the modernity project, the hypothesised model demonstrates that the rationalisation process in the systemsworld is often undertaken at the expense of the rationalisation of lifeworld. When social actors are subordinated to the imperative of system rationalisation, the communicative practices of the lifeworld are undermined. On the other hand, what the study's models demonstrate is that the system rationalisation facilitates lifeworld rationalisation by unburdening its communicative infrastructure. Thus, when lifeworld and system rationalisation do not proceed at commensurate rates, the deliberative process becomes subject to the possibility of subversion by unregulated strategic action of individuals. Under these circumstances, the effectiveness of the deliberative process is compromised. Our analysis of the non-hypothesised model demonstrates that some system functions are needed to draw the teams' lifeworld into a bounded set of preferences to particular states. 8.5 There are a number of limitations of the models. To operationalise Habermas's theory is indeed an ambitious enterprise, yet for precisely the same reason, the models are inherently inadequate. Operationalising any theory is limited by the sophistication of the available mathematical concepts and tools, and as G�del l's (1962) proofs of the 1930s demonstrated, formalised mathematical, indeed all symbolic systems contain inherent fault lines. The models presented in this paper are no exception. 8.6 The second limitation of the study, which is possible to overcome, is that our models do not incorporate turnover of members. In reality, individuals join and leave knowledge teams over time. Future refinements to the models should include spontaneous departures and replacements of team members, each entering with different levels of generalisable knowledge and discourse ethic. A second refinement, as discussed in the previous section, would be to explore means of incorporating system interventions. 8.7 In this paper we use the models as a means to critically reflect on Habermas's theory as a first step in the larger project of operationalising the theory. The insights that have emerged from the models need to be concretised by testing and validating the models against empirical data on knowledge teams. We have begun this work by collecting and analysing data on the knowledge exchange within the multi-disciplinary health care teams operating in a jurisdiction in Canada (Quinlan & Robertson, 2010). Using the team as the unit of analysis, fluctuations in mutual understanding within the teams over time was analysed. 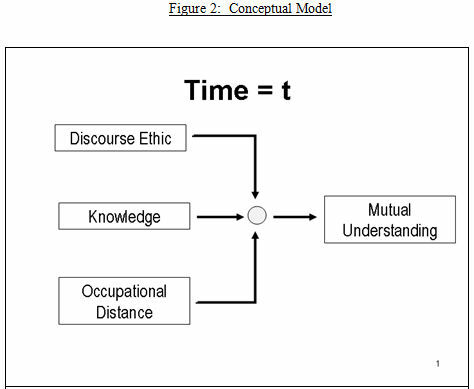 Survey data was obtained on the three dimensions of mutual understanding, informed by the Habermasian theoretical framework and used in the models of this paper: occupational distance, knowledge, and discourse ethic. Respondents were asked to consider the two most recent clinical decisions made by the team. For each of these clinical decisions, they identified the team members involved in the decision and their perceptions of dimensions of the knowledge exchange during the clinical decisions. For instance, the concept of the discourse ethic was expressed in the survey in the questions about the extent to which each team member expressed their attitudes, desires, and needs in the course of the interactions involved in the two most recent clinical decisions, and the extent to which they encouraged their fellow team members involved in the decision to do the same. 8.8 Underpinning the broader research program is the two-pronged strategy of simultaneously analysing and transforming the social world, a strategy that is consistent with Habermas's notion of the emancipatory goals of critical social theory. Thus, in a subsequent step in this research program, the models from both this paper's virtual experiments and those of the empirical application in health care teams will be used to initiate discussion with individual team members as a validity check on the models and to enable critical self-reflection and enhance mutual understanding within the teams. This check-back would have the effect of moderating hierarchies within the teams and enabling open and deliberative communication conducive to the production of knowledge. In this way a practical outcome of the work will be that knowledge workers are able to use the models as an evaluation tool so that they can assess how effective they are at communicating and producing knowledge. 2We are using 'social rules' in the sense of being a component of social geometry. See Kluver, 2004. 3measured as the density of the mutual understanding. 4Simmel's formal social geometry identifies a qualitative difference between a dyad and a triad. In the dyad, group structure is lacking and does not achieve meaning beyond the individuals involved. Adding a third individual creates potential for meaning beyond two separate individuals. Increasing membership beyond three does not produce as great of a qualitative change as moving from the dyad to the triad does (Simmel, 1950). BYRNE, D. (1998) Complexity theory and the social sciences. London: Routledge. CILLIERS, P. (1998) Complexity and Post-modernism. London: Routledge. CONTRACTOR, N., and MONGE, P. (2002) Managing knowledge networks. Management Communications Quarterly, Vol. 16, N o. 2, pp. 249-258. DAVENPORT, T., and PRUSAK, L. (1998) Working knowledge: How organisations manage what they know. Harvard Business School Press: Boston. ELIAS, N. (1994). The Civilising Process. (Trans.) E. Jephcott. Revised Edition. (Ed.) E. Dunning, J. Goudsblom, & S. Mennell. Blackwell Publishing. EVE, R., HORSFALL, S., and LEE, M.E. (editors) (1997) Chaos, Complexity and Sociology. Thousand Oaks, CA: Sage. GIDDENS, A. (1984) The constitution of society: Outline of the theory of structuration. Los Angeles: University of California Press. G�DEL, K. (1962) On formally undecidable propositions of Principia Mathematica and related systems I. Trans. by B. Meltzer. Mineola, N.Y.: Dover Books. HABERMAS, J. (2006) Political communication in media society: does democracy still enjoy an epistemic dimension? Communication Theory, Vol. 16. pp. 411-426. HABERMAS, J. (1996) Moral consciousness and communicative action. Trans. by C. Lenhardt and S. W. Nicholsen. Cambridge, Massachusetts:MIT Press. HABERMAS, J. (1987) The theory of communicative action: lifeworld and system: a critique of functionalism reason. Vol II. Trans. by Thomas McCarthy. Boston: Beacon Press. HABERMAS, J. (1984) The theory of communicative action: reason and the rationalisation of society. Vol. I. Trans. by Thomas McCarthy. Boston: Beacon Press. HOLLAND, J. (1995) Hidden order: How adaptation builds complexity. MA: Perseus. JACOBSON, T. (July 2004) Measuring communicative action for political and development participation. Paper presented at the International Association for Media and Communication Research. Porto Alegre, Brazil. KLUVER, J. (2002) An essay concerning sociocultural evolution. Dordrecht: Kluwer Academic Publishers. KNORR-CETINA, K. (1999) Epistemic Cultures: How the sciences make knowledge. Cambridge, MA: Harvard University Press. LUHMANN, N. (1990) Essays on self-reference. New York: Columbia University Press. NONAKA, I. (editor) (2005) Knowledge Management. Routledge: London. PRIGOGINE, I. (1997) The end of certainty. New York: The Free Press. QUINLAN, E., and ROBERTSON, S. (2010). Mutual Understanding within Multi-Disciplinary Primary Health Care Teams. The Journal of Inter-Professional Care, 24. Posted online 26 January 2010: 1-23. <http://informahealthcare.com/toc/jic/0/0> (Forthcoming in print August 2010). SIMMEL, G. (1950) The sociology of Georg Simmel. Trans. by Reinhard Bendix. In Georg Simmel, Conflict and the web of group affiliations. Glencoe, Ill: Free Press. SZULANSKI, G. (2003) Sticky knowledge: barriers to knowing in the firm. Thousand Oaks, CA: Sage. TURNER, E. (1997) Forward: Chaos and social systems. In R.A. Eve, S. Horsfall & M.E. Lee (editors) Chaos, complexity, and sociology. (pp. xi-xxvii). Thousand Oaks, CA: Sage. WENGER, E. 2000) Communities of practice: The key to knowledge strategy. In E. Less, M. Fontaine, J. Slusher (editor) Oxford: Butterworth-Heinemann. WENGER, E. 1998) Communities of practice: learning, meaning and identity. New York: Cambridge University Press. WENGER, E., McDERMOTT, R., and Snyder, W. (2002) Cultivating communities of practice: a guide to managing knowledge. Boston: Harvard Business School Press.